UPDATED: APR 14, 2019 A small can from Simplemart down the road. Not sure if this is the same beer - could be marketed in the Far East as 'Beck's Extreme', the ABV [5%] tallies. Either way, well-named as this is extremely ordinary. A touch on the sweet side, drink as cold as possible. UPDATED: DEC 31, 2018 lager alemana comercial. poca espuma. carbonatacion media. color ambar pálido. poco aroma. gusto menos amargo che la beck's normal y que la beck's gold. menos lupulo. críticos. cuerpo ligero. retrogusto casi inexistente. refrescante con un sabor mas agradable de las otras para mi gusto. 330 ml bottle from a supermarket in Italy. I don’t know if it is a version only for Italy. Colour is pale yellow with a small white head that quickly disappears. 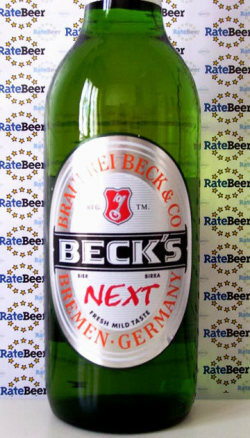 Very similar to the normal Beck’s. This is a version less bitter (the only thing that I saved in the normal version…). Aroma is poor. Taste is inconsistent. Terrible. Draft in Trieste. Pale cold lager. Orange. Sweet, smooth. Odd fruit. Cold and blonde, this drinks clean, but it’s got problems. Bottle. Clear yellow with a white head. Pretty standard cheap lager. Pissy, light skunk, cheap grain, and watery. Ordinaria, piú malto, preferisco di gran lunga la classica. Sembra una peroni sbiadita. Bottle @ home. é , se possibile, peggio dell’originale. La caratteristica luppolatura delle Beck’s è stata cancellata, non da una maltatura più decisa ma da una scomparsa di ogni tipo di gusto. Colore oro scarico, poco carbonata schiuma quasi assente.